I Fly America:.Michigan's Western U.P. Learn about the Western UP area of Michigan by reading Michigan's Western U.P - An Anytime Destination by Charlie Spence, Aviation Writer. It features a mini, but thorough tour of the destination, plus all you'll need to know to plan your trip including getting there, objective information on places to stay and eat, and things to do. Enjoy! Pick any time of the year and it's the right time for a visit to Michigan's Western Upper Peninsula. This unique area has a diversity of places, activities, and attractions that fit every season and every personal search for vacation pleasure. In the winter, the Big Snow Country offers some of the best Alpine skiing in the Midwest. Five fine ski areas are within an hour's drive of each other. They offer more than a hundred trails providing fun and challenges for skiers from novice to expert. Choose from downhill or cross-country, snowboarding or snowmobiling. There are more than 100 trails for skiers and snowboarders of any experience level. The Western Upper Peninsula is at the hub of more than 2,000 miles of trails for the snowmobile crowd. Vehicle rentals are available and you will even find refreshments along the trails. The three mountains - Indianhead, Big Powder Horn, and Blackjack - offer challenging slopes and beautiful trails and admissions are interchangeable. Select a two, three, or four-day package options and ski a different mountain each day if you choose. 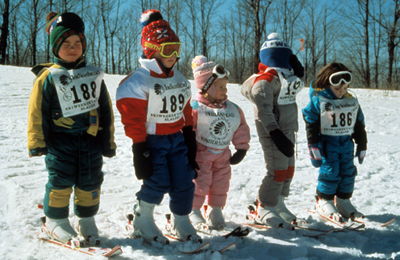 Children Ready for Downhill Ski Race. Knowing that all moments can't be spent bundled in ski clothes and schussing, the lodges make the apr's-ski times pleasurable with a selection of dining options, spas, pools, and other recreational facilities. Once the snow starts to melt, a whole new variety of pleasure sites open for you. Trees begin to green up, trails beckon for hiking or biking, and sights abound with waterfalls, breath-taking views, historic structures, and numerous golf courses. Short hikes or backpacking explorations of the forests take you into beautiful areas. By all means take in the Copper Peak Adventure. Ride the 800-foot chair lift to the crest of the hill and then take the 18-story elevator to the observation decks atop a giant structure. From here you will have a 360-degree panorama of unobstructed views of this section of Michigan and the Midwest. From this vantage point it is possible to see more than 2,500 square miles overlooking Lake Superior and the hardwood forests. With the right conditions, you might see the Minnesota northern shore of the lake some 85 miles away near the Canadian border. In the fall, the foliage is incredibly beautiful, so be certain to have the camera ready. Copper Peak is open Tuesday through Sunday from mid-June through Labor Day, and on weekends from Memorial Day to mid-June and after Labor Day while the foliage is still beautiful. And speaking of cameras, if there are children along, take them to pose by Hiawatha, a 52-foot tall Native American statue towering over Burma Street in the city of Ironwood. The chamber of commerce readily admits it was erected primarily to attract visitors, and that it does. View of Lake Superior in the Upper Peninsula. Water lovers will have a problem here - a problem of trying to choose which of the many fine water attractions will be enjoyed and which will linger in the memory as a 'wish I had' experience. Lake Superior is really that - superior. Because of its size, it is more like an ocean than a lake. Boats are available half day or all day for fishing and pleasure cruises. Charter a boat for fishing and the price includes all fishing tackle and fish cleaning. Most of the all day charters include a 'no fish, no pay' guarantee. Sunset cruises are available, usually between 6:00 p.m. and 9:00 p.m. You can explore the shoreline and the mouths of rivers yourself in a kayak. Don't be surprised if a bald eagle gives you the eye along the way. 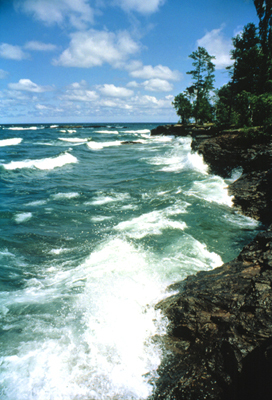 Lake Superior is the most obvious water attraction in the area, but it is just one of many. More than 300 other lakes, hundreds of miles of rivers, and more than 50 waterfalls in just one county provide the setting for exciting water activities and 'ahh-inspiring' beauty. Here are some prime fishing waters - walleye, small mouth bass, northern pike, and jumbo perch. 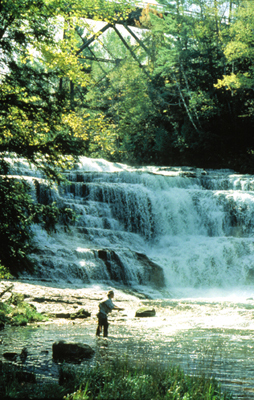 Beautiful, thunderous, and majestic waterfalls abound in the area. There are more than 100, all well marked and most with parking areas nearby. Hiking trails will take you to some; canoes and kayaks are available for you to paddle off to fish many of the lakes and streams. If you enjoy a mystery, one evening drive to observe the Pauling Mystery Light phenomenon. First sighted many years ago, 'The Light' still defies explanation, although there are many theories and legends. It can be observed almost every night in the dense woods once darkness has set in. Sightseers describe it in various ways. Usually it is noting a faint glow, seemingly rising from below the horizon. Then a bright light appears. Some have seen red lights dancing in the glow. It has been seen for periods of a couple of minutes to hovering more than a quarter of an hour before dropping back below the horizon. Some say it is the spirit of a long-dead mail carrier ambushed by Indians more than a century ago. Others suggest it is the ghost of an engineer killed in a nearby railroad accident years ago. Aliens, perhaps? Skeptics put forth that it might be automobile lights'but over so many, many years'and appearing for such varying lengths of time'? Draw your own conclusions. The national, state, and local parks are attractive wilderness and nature locations where you might sight a variety of birds and animals. It is estimated that between 15,000 and 19,000 black bears inhabit the area. You may spot one as you explore their habitat, but more than likely they will sense your odor first and scamper away. But, you should be alert and never leave food and equipment unattended. There is rustic charm, small-town hospitality, natural wonders, Las Vegas style gambling, and year-round attractions to please you at Michigan's Upper Peninsula. Several airports welcome you to this area. The one near the town of Ironwood offers much but has fees - landing, parking, tie-down, and hangar. Its asphalt runway is 6501 x 130. Approaches are VOR (the VOR - IWD - is on the field), VOR/DME, GPS RNAV. Commuter flights serve there from Minneapolis. There are ultralight operations. 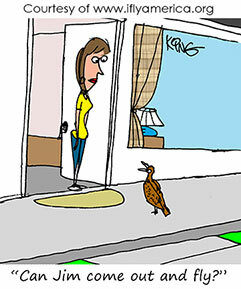 Also watch for deer and birds in the vicinity. Because the U.P. has so much to offer and attracts many visitors, there are numerous and varied accommodations. Facilities are available in a number of small communities and some specifically at the ski centers. Prices range from $20 to $40 a night to $75 and up. Prices will vary with the season and whether or not that particular facility is geared to a special season. Select the time of year you want to visit and your rates might be less in off seasons. Notice: This information is current as of January 2007. It is recommended that you contact the establishments mentioned above to determine any changes to the information.